Parsons: "I like the frowning sun," says Parsons -- a poetic line, it strikes me -- but he still tags Uruguay for "graven images" and assigns a "B-", 65/100. Michael5000: It's been two years since I covered Argentina in this series, perhaps a bit uncharitably in retrospect. Uruguay, just across the bay, has the same white, blue, and "Sun of May," but configured differently. The multitude of stripes risks the kind of clown-pants effect I complained of in the last installment, but ten stripes is better than thirteen and blue a little more subdued than red. Too, Uruguay's blue is much bolder than Argentina's; I usually feel that sky blue is a problematic choice for a piece of fabric that is going to be set off against the, um, sky. The Sun of May, originally a symbol representing an Incan God, was adopted as a symbol of independence from Spain in the early 1800s. On a conceptual level, it niggles at me just a little bit that, well, what is an Incan symbol doing way the hell out in Uruguay? It seems kind of like, I don't know, Nigeria putting the Sphinx on its flag. Or a new flag for Maryland featuring the Space Needle. But, that's nobody's business but the Uruguayans. Parsons: It has "too many stars" and is "too busy," getting a "C", 56/100. Michael5000: Uh-oh, I just dissed sky-blue on flags, and here we are in Uzbekistan, which has an awesome flag with a sky-blue field. Does it have too many stars? Yeah, sure. But it has red stripelets, a nice piece of innovation that add some heat to the otherwise cool color palette. 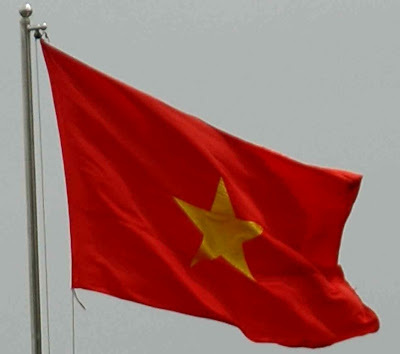 That flash of red also provides elements of visibility and uniqueness, which is good on a flag. Is it too busy? Let's ask the crowd! Nah, they seem to like it. 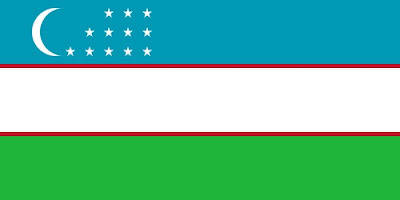 Like almost all of the post-Soviet states, Uzbekistan did a good job with flag design. Parsons: It has "good colours" but is "too busy" and "has too many stars." Parsons gives it a "C+", 60/100. 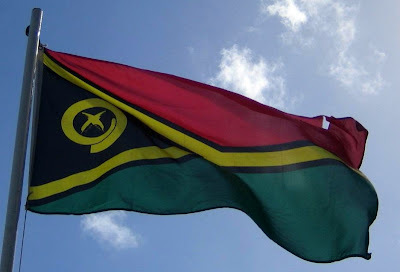 Michael5000: This is it, the occasion for us to learn the answer to the question we've all been asking ourselves since Vanuatu became independent in 1980! To wit, "What the hell is that posthorn-looking dealie?" Turns out it's a boar's tusk. Boar's tusks are apparently considered a good luck charm locally. Well, O.K., that's a pretty reasonable and sew-able flag symbol. But inside the boar's tusk? That's apparently two leaves of the namele fern, with 39 fronds to represent the 39 members of Vanuatu's legislative assembly. Whoa, what?!? That's not only way too much detail on a flag emblem, but symbolizing the number of your legislators on a flag is a terrible precident! I mean, what if the United States heard about it? You'd end up with a 535-star flag, that's what. Otherwise, it's pretty nice. I like the use of black, particularly the black stripelets. Vatican -- Listed out of sequence, here. Parsons: With "good colours," it gets a "B", 70/100. Michael5000: It's been a long time since we talked about the Colombia-Ecuador-Venezuela business, so the serious student of flagginess will wish to refresh his or her memory. Meanwhile, the flag of Venezuela in particular seems to be interestingly flexible. Like a lot of Latin American flags we have looked at, for instance, there is a simple design (seen above) for the general-use civil flag, but the state flag is a dressed-up version with a coat of arms. Both of these are a relatively new eight-star version introduced by President Hugo Chávez in 2006. 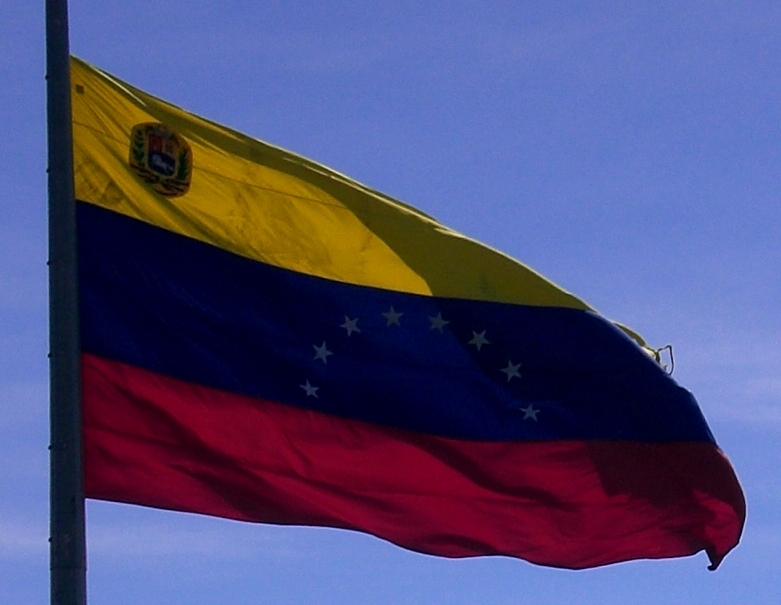 Like everything Mr. Chávez says, does, or is in any way connected with, the eight-star flag is of course a point of much controversy. There was, for a while anyway, a bit of a resistance movement keeping the older seven-star version in use. 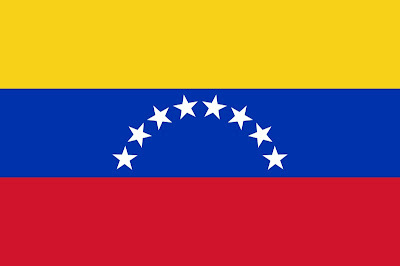 This has calmed down as far as I can tell, and the eight-star Venezuelan flag seems to be a fait accompli, but I'd bet my eyeteeth that there are plenty of irritated holdouts. Parsons: It's "simple," but "not quite as nice as Somalia." "A", 85/100. Michael5000: It's very visible, although not perhaps especially easy on the eyes. It's interesting that such a -- take your pick -- simple/boring design choice as a star in the middle of a background is so distinctive. Its closest peers are China and Somalia, and you're not going to confuse it with either one of those. The Vatican, absurdly, is listed here. I should put up a pointer. Looking into the future, I see that it is two (2) weeks to the final Flag Friday, that -- rejoice! -- Western Sahara heads up the pack. Well, it isn't quite excited for W. Sahara (I personally give it a C+, but I like the novelty of the different sides of the flag), but just excited for Flag Friday in general, as I said, my favourite part of the site. Knowing it'll be the last one will make it bittersweet. I agree. Flag Fridays will be missed. Maybe you should assemble all your Flag Fridays posts into a coffee table book, though you'd probably have to cut Parsons into the proceeds. I don't get the love for Uzbekistan. The star/moon combo looks like it was designed in Excel-what is with that alignment? The flat version you put up has that odd turquoise blue but the photo shows a more flaggy bright blue. Either one seems to clash bit with the acid green. The skinny stripelets also add odd proportions to this already skinny long flag. I guess it goes well with some of the other oddball colored former USSR flags? I like the top 5 / bottom 5 recap idea. I think you should have a special edition for the most prominent of the "sub-national" flags, for example, Wales, Scotland, & England, and some of the more prominent islands which might be owned by other countries, yet deserve a shout-out, like Martinique, or Bonaire. And the "Union Jack Blue Ensign with a seal" flag(s) should get a rating (the same one) just because of the ubiquity or it. I think we should move onto state/territory flags. Brazil and Japan have some awful interesting (read weird) sub-national flags. Im also a big fan of the Brittany, France flag and the Cornwall/Devon, UK flags.